For anyone who’s been following my blog for the past few weeks, it should be obvious that I’m developing a love-hate relationship with both Windows Vista and Kubuntu Feisty Fawn. Here’s the thing. We’re moving in three weeks. Up until then, we live on a university campus where my wife is finishing up her master’s degree. We’re paying for two internet connections, but we have three computers. So for the most part, I’ve only been able to use my new laptop when I wander out of the house and into a public WiFi hot spot or to a friends’ house. So I haven’t had too much time to play with either Windows Vista Home Premium, which came preinstalled, or Kubuntu, which I installed myself. I probably should have gone with Ubuntu’s default Gnome desktop, but I knew just enough about Linux desktops to be dangerous. I knew that I liked the look and feel of KDE. Unfortunately I don’t really know that much about Linux yet, and since most of the user-friendly Ubuntu tutorials are written for folks using the Gnome desktop, I’ve been at the bottom of a steep learning curve that hasn’t been helped by the fact that I rarely have a live internect connection on this computer. Anyway, I just spent the last hour or so installing and playing around with Beryl and Automatix2, inspired by a lifehacker post on a list of free Ubuntu applications. Automatix2 worked as promised, and made it easy to install programs like Skype (which I’d already managed to install on my own). Beryl installed like a breeze using the Adept package manager. It took me a while to figure out how to get it to run though, and once I did, I couldn’t figure out how to open and close windows with a mouse. I had to lookup the keyboard shortcuts. All of which is to say that Beryl is visually stunning, and looks at least as cool as any of the graphics enhancements in Windows Vista. But there’s one thing Vista has that Beryl and Ubuntu in general doesn’t right now. It makes sense out of the box to anybody who’s ever used Windows. There are a few things that behave differently in Vista than XP, but they’re not hard to figure out. And running Vista on a widescreen laptop is actually a pleasure. 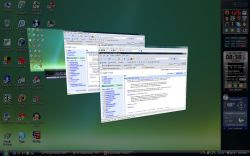 The first time I installed Google Desktop on an XP machine, I couldn’t figure out why anybody would want a sidebar that is always on top. It just took up too much screen real estate. But now that I have a widescreen display, that space on the end just doesn’t seem that necessary for open applications. It’s a great place for a program launchers, system monitor, clock, and weather applet. One thing that bugs me though. In order to perform some actions, like use Aero’s flip 3-D function, you need to hit the Windows key and the tab button simultaneously. If the Windows key was on the bottom right of my keyboard like it is on most desktop keyboards, that would be fine. But it’s all the way in the upper right-hand side, meaning you need to use two hands to use flip-3D. So for the most part, I’ll be sticking with the duller Alt-Tab combination to cycle through open windows. Of course, the main reason I’m sticking with Vista as my primary operating system on this PC for now is the fact that I can’t seem to configure Ardour to work. And a radio reporter/podcaster isn’t much good these days without a good digital audio workstation. Sure, Audacity is easy to use, but it’s just not really powerful enough as a multitrack editor for my needs.